One of the most delicious ways to celebrate St. Patrick’s Day, or just warm up on a cold night, is with a nice cup (or two!) of freshly-brewed Irish Coffee. The original recipe calls for a cup of hot coffee, a pinch of brown sugar, heavy cream or Bailey’s, and of course, Irish whiskey such as Jameson. We suggest Trying out a coffee base from Illy or Kicking Horse for an exceptionally rich and smooth cup that is fair-trade and sustainable, too. Although the classic recipe is the perfect way to spruce up your usual caffeine fix…on a weekend, of course, you’ll soon find that the pot of gold at the end of the rainbow was actually a pot of Irish coffee with these unique twists. Just like a caramel latte, with a festive spin. Add 2 teaspoons of butterscotch Schnapps to an 8-ounce Irish coffee for an even sweeter sip. One cup will definitely have you feeling the luck of the Irish! Who doesn’t love chocolate? For a decadent and dessert-like flavor, use half hot chocolate and half hot coffee as the base for your drink. If you want to go big for this one, make your own chocolate whipped cream (recipe here) or just add chocolate shavings as a garnish for something a bit more subtle. Although not quite as green as a four-leaf clover, this minty Irish Coffee will definitely ensure you don’t get pinched this St. Patty’s Day. Add 2 teaspoons of mint Schnapps to your 8-ounce Irish coffee for a refreshing twist! Take it a step further by sprinkling some fresh mint leaves on top. Enjoying a warm spring St. Patrick’s Day? 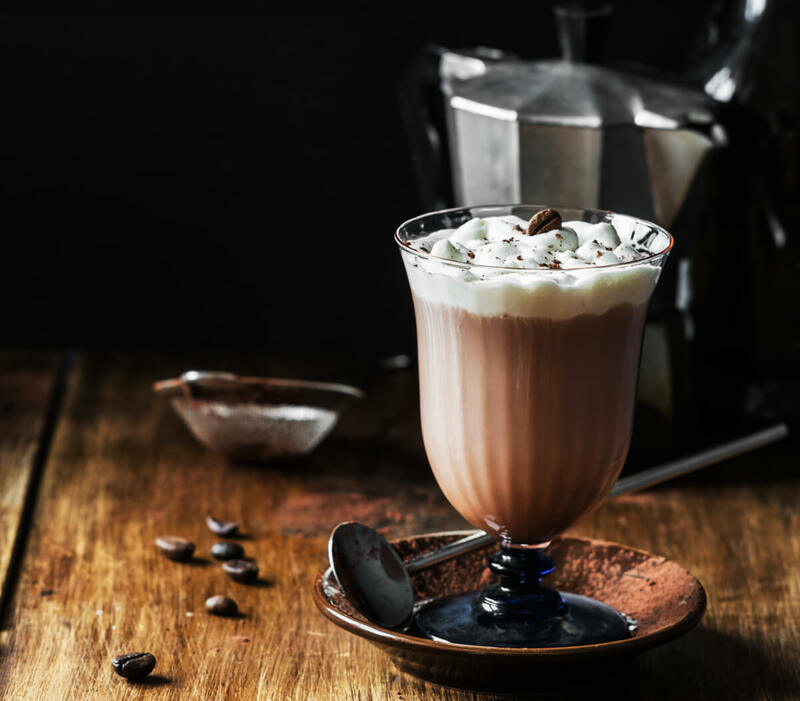 Then shake up your coffee and Jameson with ice and nice pour of Bailey’s Irish cream too for a creamy iced Irish coffee that’s definitely irresistible. This one’s for the Nutella fans. No, you’re not using the hazelnut spread. Instead, you’ll be adding a quick pour of the hazelnut flavor liqueur, Frangelico to your coffee, Jameson, and cream. Trust us on this one.